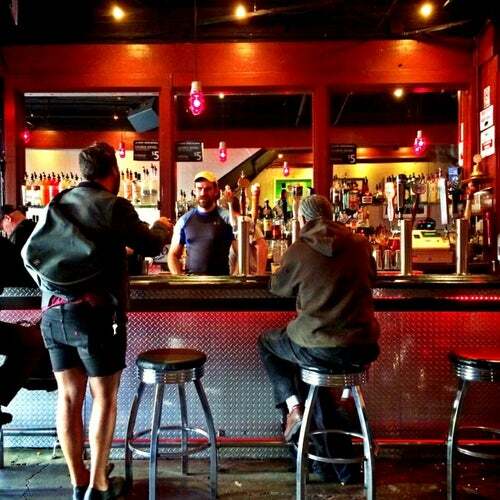 440 Castro is a must-stop for those into the bear scene. The bar often throngs on weekends with men of all ages enjoying the intimate interior. Bar reminds me of what bars used to be like in 1980s. Friendly bartenders, frisky atmosphere, and strong drinks. What else could someone ask for. My husband & I visited SF for the first time over Labor Day weekend and made the rounds of the bars in the Castro district. Bar 440 was definitely our favorite! Great atmosphere (nice, friendly, good vibe). Junior the bartender was absolutely a gem! He remembered what we drank after serving us our first drink and gave us pointers on what to see and do while we were in town. We loved him (he's very hot too) and the bar! Can't wait to go back! 440 was our favorite place in the Castro. David and I were in San Fran for only two weeks, these guys’ made strong connections and strong drinks. The people were all friendly and I would say any traveler needs to make this bar “home”. Thank you all at the bar for contributing to some great travel memories. Great fun place and the music is fantastic! Hot daddies, muscle bears, strong drinks and cruisy bathroom. Enjoy! GREAT DRINKS! BARTENDER ARE BEAR HOT !! LOTS OF FURRY FUN!! Gotta admit as I get older I'm liking the beefy guy with facial hair and denims a whole lot more these days. Friendly crowd with just a hint of cruising and sometime the ocassional hot go-go boy dancing. Drinks are reasonable too. The decor is standard, gaybar/tough place okay and when crowded it can get hot and a little more than filled with man-scent. Best Cruising in the Castro - in the back upstairs! It's always busy here, day and night; great place to meet friends, have a drink. Attracts all types of guys. It does get crowded, but definitely my favorite bar in the Castro.